Excerpts from the Guardian Life Insurance Company’s Workplace Benefits Study: Fourth Annual, 2016. Reprinted with permission. Read the entire report here. In recent years, a greater number of working Americans have left the 9-to-5 career path for the “gig economy,” taking on part-time, contingent, or independent contractor positions. According to the Bureau of Labor Statistics, the proportion of the U.S. workforce employed part-time (i.e., less than 35 hours per week at any one employer) has increased gradually for decades, from 13.5% in 1968 to record levels in 2010 during the Great Recession. As of March 2017, the figure is at 18.2%. The number of Americans who are working part-time but would prefer full-time jobs (5.5 million), has been trending downward since the peak of the recession in 2010. Meanwhile, voluntary part-time employment spiked in the years following the passage of the Affordable Care Act (ACA) and has grown to more than 27 million. Some experts believe this may be a “new normal” for the U.S. economy — a persistently high part-time employment rate. * Yet, the government figures for part-time labor trends do not even include the ranks of freelancers and independent contractors/ consultants, which bring the total size of the gig workforce to more than 40 million. Part-time, contingent, or freelance workers can be found in practically any company, but they are increasingly becoming the cornerstone for many businesses across a variety of industries. Technology and social networking sites have also contributed by making it easy and efficient for companies to locate and recruit the talent they need, especially for “just-in-time” assignments. While many Americans desire the advantages of a part-time work schedule, the financial disadvantages can be a deal-breaker. At best, part-timers typically receive reduced employee bene ts packages compared to full-timers. Many are ineligible to receive any bene ts at all and, therefore, lack valuable medical coverage, retirement savings plans, life insurance, unemployment insurance, and workers’ compensation. Given the important role these bene ts play in protecting the financial security of working Americans and their families, it may be time to sound the alarm for America’s growing Part-Time Nation. The American labor force appears to be undergoing a fundamental shift from traditional single employer, 40-hour work weeks to a more flexible, “on demand” model. As more employers embrace the new “gig” or “ ex” economy, the ranks of part-timers, including independent contractors, will continue to rise. In Guardian’s latest research, employers reported that just over 82% of their workforce are full-time, permanent employees, while 13% are part-time employees (or work fewer than 35 hours) and 5% are independent contract workers. These proportions are consistent with U.S. Bureau of Labor Statistics for the past few years, where the annual average for part-time/contract workers ranges from 17.5% to 18.5%. And more employers expect their part-time workforce (including contractors) to grow over the next three years. About 1 in 3 employers anticipate growth in part-time workers, while 13% expect a decrease — a net of more than 20% of employers projecting growth in their part-time workforce. Larger companies are even more likely to expect growth in their part-time workforce. Just over half of rms with at least 1,000 employees anticipate increases in part-time workers with just 9% foreseeing declines, or a net of 44% of employers expecting at least some growth in their part-time workforce. A majority of part-time workers do not have financially dependent children and earn less than $50,000 a year in household income. They are also more likely to work for companies with 5 to 99 employees and most have not received a four-year college degree. Among part-timers surveyed, 1 in 3 work in the hospitality industry (e.g., waiter/waitress, hotel front desk, tour guide, amusement park attendant), and roughly 1 in 5 are employed in health care (e.g., nurse, technician, home health aide, therapist) and retail (cashier, sales associate, customer service) sectors. And another 35% combined work in the construction, financial services, and manufacturing industries. 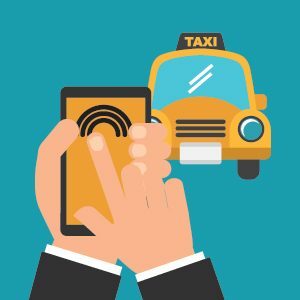 The most talked about benefit of working part-time is flexibility, such as Uber and Lyft drivers who can decide to work where and when they want. Part-time work also allows people to try a few different jobs before deciding what career they want to pursue full-time, and gives those having trouble finding full-time work an opportunity to make a positive impression. The downside is that most part-time jobs in the U.S. come with no insurance or retirement savings benefits: Only 32% of part-timers say they receive such bene ts compared to 87% of full-time workers. Larger companies are more likely to o er bene ts to full-time and part-time workers, with nearly half of firms with 1,000+ employees providing bene ts for their part-time workforce. Access to different kinds of workplace bene ts (e.g., retirement savings plans, medical coverage, other forms of insurance) varies and is consistently much lower for part-timers compared to those in full-time positions. 1 in 3 have an employer-sponsored retirement plan (vs. 69% of full-timers), only 1 in 4 part-timers have an employer- sponsored medical plan (vs. 80%), and fewer than 20% have dental, disability, or life insurance bene ts at work (compared to more than 50% of full-timers). on their own (e.g., through health insurance exchange, an association/a nity group, or direct from an insurance company). And they typically pay higher out-of-pocket costs for their coverage compared to full-time workers with an employer- sponsored plan. One in three part-timers belong to a trade association or affinity group and are three times more likely than full-timers to have purchased medical, supplemental health, and dental coverage through an association to address gaps in their workplace benefits. On average, 25% of part-time workers live in poverty compared to just 5% of those working full-time. * Part-timers often face financial obstacles such as: being paid less per hour than full-timers for doing the same job, being required to pay their own Social Security and Medicare taxes, being ineligible to claim unemployment bene ts, overtime pay, and rest breaks, in addition to having less access to employer-based benefits. And even when benefits are made available to part-time workers, they are generally sparse and include just a medical plan with fairly limited coverage. Most part-timers are not working with a financial advisor and are not purchasing insurance outside the workplace for themselves and their families, nor are many saving money in a retirement account. Despite the lack of access to employee bene ts, part-time workers believe they are faring well financially relative to full-timers. Unfortunately, many part-timers and their families may be financially vulnerable or have a false sense of security. But not all part-timers are equally confident about their financial situation. Much like full-time workers, Generation X and single parents are more likely to cite money and personal finances as the primary source of stress in their life. They are struggling to make progress on saving for retirement and reducing debt, and often lack confidence in their ability to pay a $3,000 medical bill, especially when compared to baby boomers or married workers. 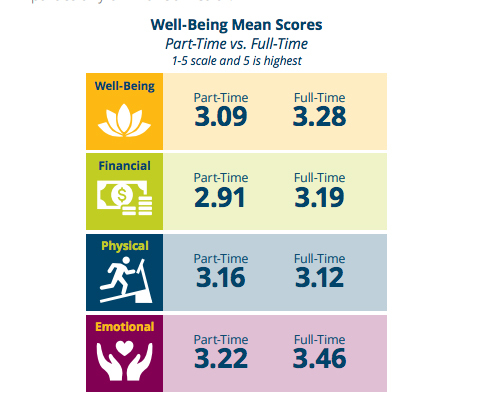 Based on Guardian’s 2016 Workforce Well-Being Index, part-timers appear to be struggling to a greater extent than full-timers on each component of well-being, but especially on the financial measure. More part-timers rated their financial situation as “fair or poor” than “excellent or very good” when compared to full-time workers. Consistent with other findings in this study, Generation X and single parents tend to have lower well-being scores, particularly on financial health. Clearly, having access to insurance and retirement benefits at the workplace has a positive effect on one’s level of financial preparedness. Among full-time and part-time workers who receive benefits from their employer, a majority indicate that they rely heavily on their benefits for financial security for themselves and their families, and they would face financial hardship without them. As might be expected, part-timers who do receive workplace bene ts have more favorable attitudes toward their overall health and well-being compared to those part-timers who do not have employer-based insurance or retirement benefits. 27 million part-time workers, three-fourths work part-time voluntarily for “non-economic” reasons. These workers prefer or need the flexibility of part-time jobs for a variety of reasons, including: to provide child or elder care, to address their own health issues, to transition after completing a full-time career, to start a new business, or simply to pursue an avocation. Since the height of the Great Recession in 2010 and the advent of the ACA, voluntary part-time employment is up more than 10%, while the number of involuntary part-timers (e.g., those seeking full-time work) has declined by 40% since peaking at 9.2 million in March 2010. Notably, job and employer satisfaction are essentially the same among part-time and full-time workers. More than half of both groups are highly satis ed with their job, and most would prefer to remain with their current employer for at least another three years. Attitudes of part-timers vary depending on whether they receive insurance and retirement bene ts from their employer. Naturally, part-timers who receive benefits at work not only feel more financially secure, but also have more positive attitudes toward their employer and their job compared to those who do not receive such benefits.